Friend, the Pittsburgh Parks Conservancy is your non-profit partner in the parks. From volunteer events to free family-friendly education programs, we’re committed to making your life better in all the ways healthy, vibrant parks can. Read on to see what's going on in your parks this month! Support Allegheny Commons (Pittsburgh's oldest park!) while enjoying tasty brews at Park on Tap, an exclusive 21+ event on March 10th. Spring into action at the Frick Environmental Center with our March theme: get up, get out! 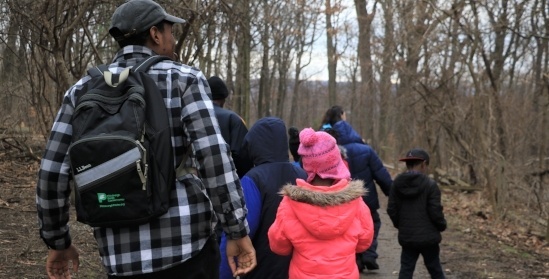 Take part in free hikes that will get you moving in March. Ride Schenley Plaza's feature family attraction from April until October with our 2017 Season Pass. Normally $60, save $15 by purchasing your pass before May 14th. >> Get your 2017 Season Pass here. Originally part of the Richard Beatty Mellon estate, the Mellon Park Walled Garden is a beloved public gathering place. In 2009, the Parks Conservancy revived the garden's plantings, repaired its infrastructure, and added seating. The restoration honors the memory of Ann Katharine Seamans, who visited the garden often during her life. An art installation, created by artist Janet Zweig, pays tribute to Annie by bringing the pattern of the night sky on the day of her birth into the lawn through fiber optic "stars."